Replies: 241 (Who? ), Viewed: 196406 times. #1 7th Dec 2010 at 2:43 AM Last edited by simsample : 30th Nov 2012 at 12:48 PM. 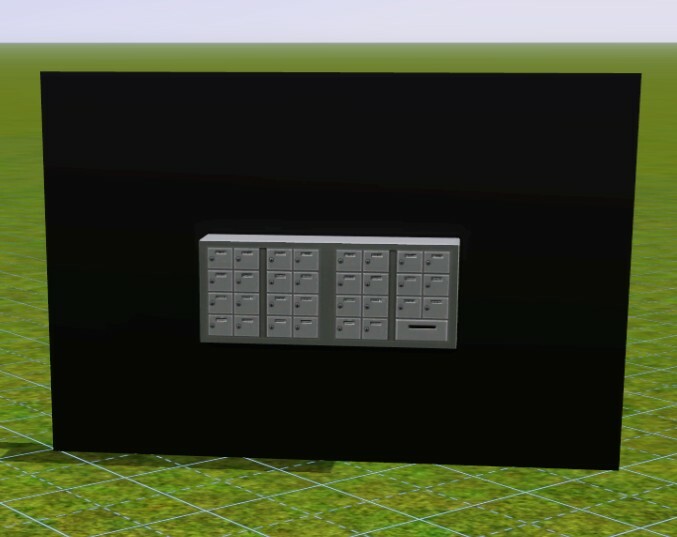 It always annoys me when I see an object in the build catalog that would suit my world, only to find it doesn't show up in CAW metadata. 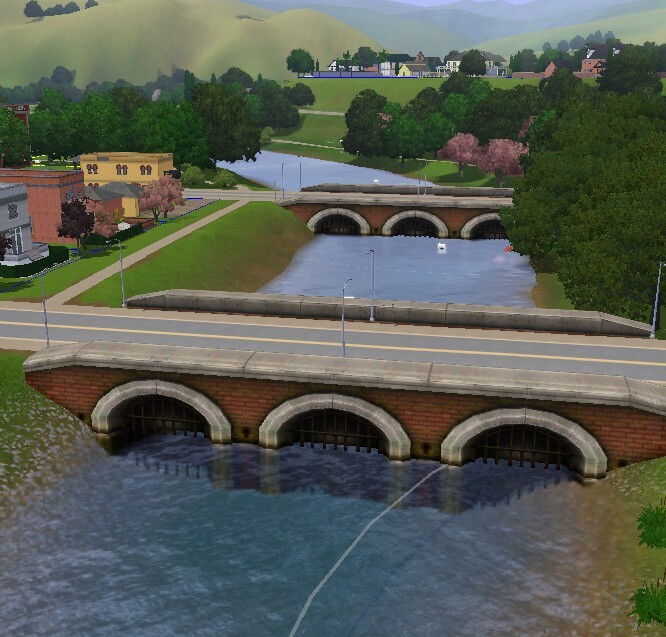 So, I was really pleased when I found GiLaNg's mod here that enables some Twinbrook items, and GiLaNg's instructions here that enabled me to learn this myself. I wrote a tutorial here to accompany GiLaNg's instructions. Over the past few months I've modded several items, and so I'm putting them here for you all to try out. Showtime items- see post 3. Daniel has added some liberated rabbitholes in this post. Thanks Daniel! Armiel has also posted the Streetbright lamp without the flag and the Ranch streetlight from Appaloosa in this post. Thanks Armiel! 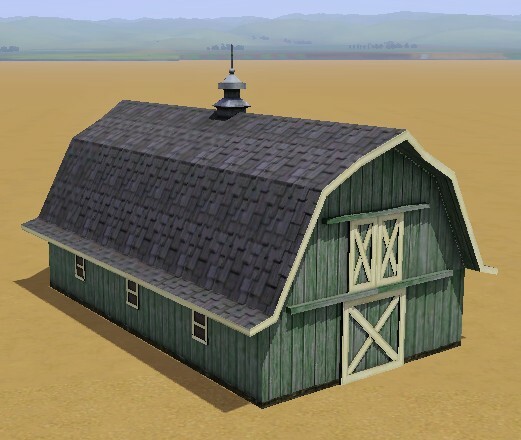 Rockerduck has posted some Appaloosa Plains objects and rabbitholes in this post. Thanks Rockerduck! Miuki has liberated some benches, get them from this post. Thank you Miuki! 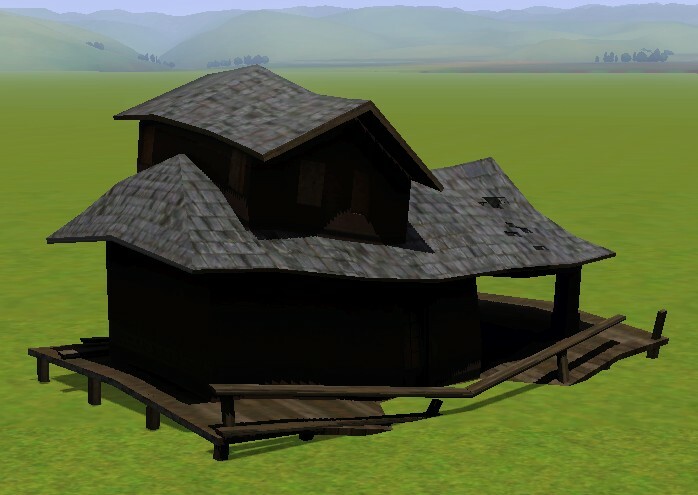 Some more items from Riverview are available from Calislahn in this post. Thanks, Calislahn! If an item you need is not in this thread or GiLaNg's thread, then check out Shimrod's mod too (all of those items will show in metadata). If you still cannot find the item you need, please consider modding it yourself and then sharing it in our resources section. If you want to have every build/buy object available in metadata, consider using SuperCAW. 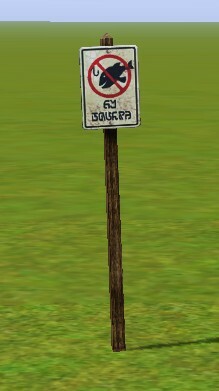 None of these items are modified in any way other than to allow them to be accessed in CAW. If you use these objects in your worlds then people who play your worlds will NOT have to download these items (as they are already in the game files) provided that they have the required EPs. The following require the Ambitions EP. The following requires the World Adventures EP. The following require the Pets EP. 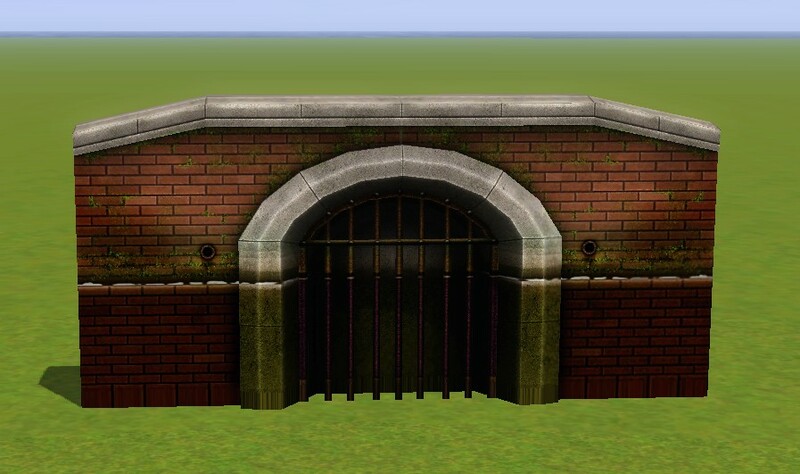 Other Pets items missing from CAW are available- fences here by TVRDesigns and animal spawners here by porphyria259. The following items are all bundled together in one package- download 'Bluefunk_PetsMetadata.zip'. The post shows up in metadata as 'Brick and Mortar Fence'. The fence shows up in metadata as 'Rustic Ranch Fence'. 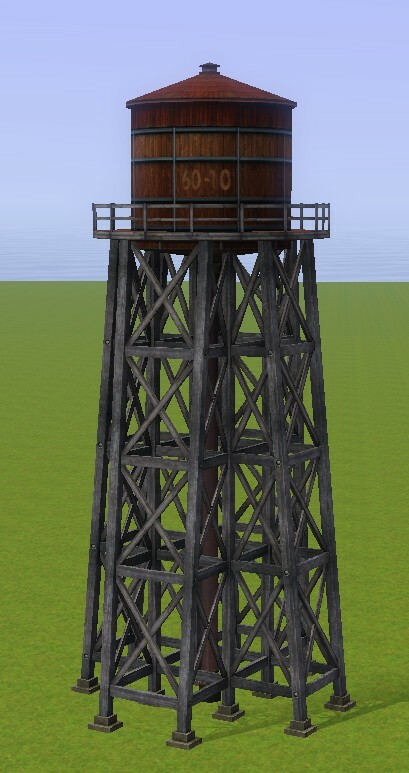 Shows up in metadata as 'Waylon's Water Tower'. This item is huge- as big as a high rise! 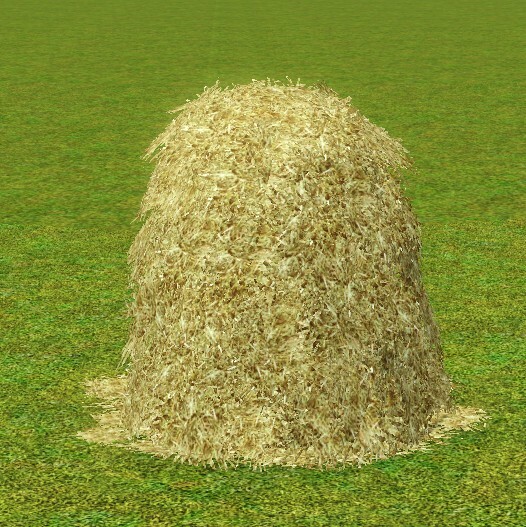 Shows up in metadata as 'Haystack'. 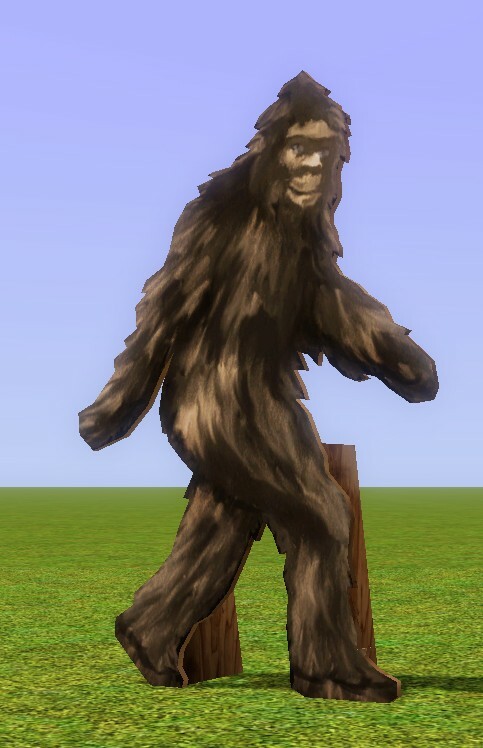 Shows up in metadata as 'sasquatch standee'. 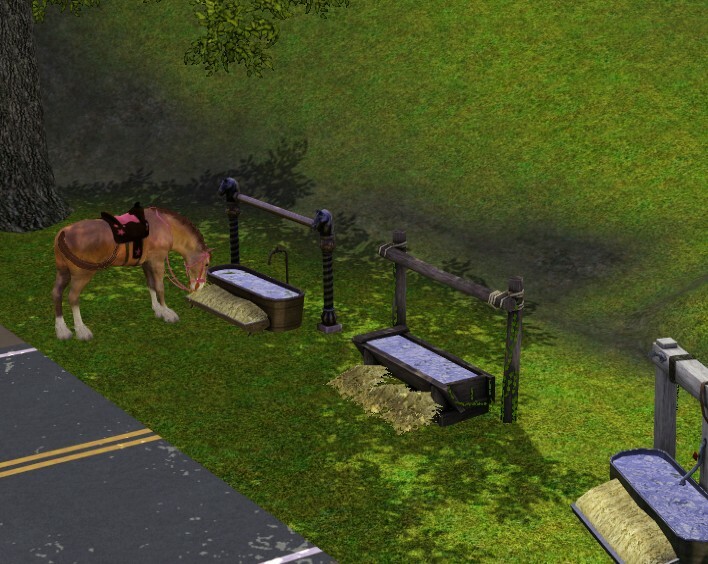 Pets Hitching Rails and Water Trough As requested by heaven! 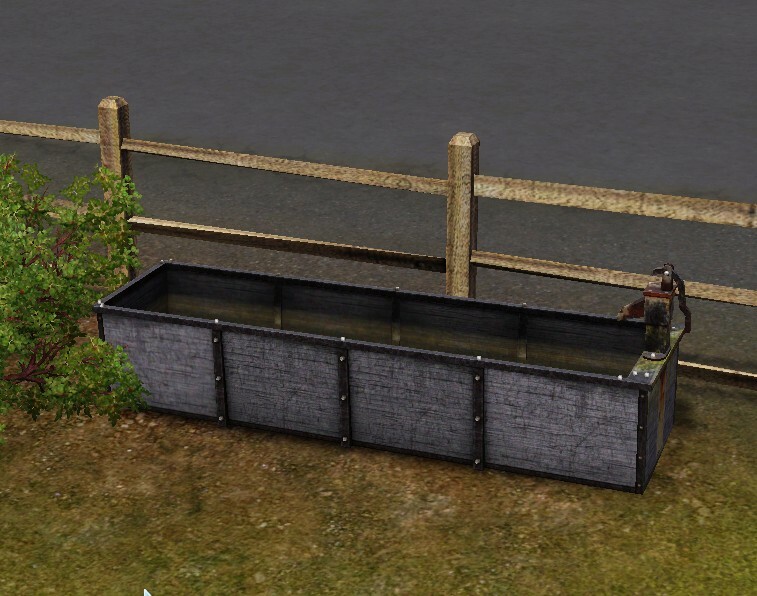 The hitching rails and water trough are bundled in one package- download 'Bluefunk_HitchingPosts.zip'. 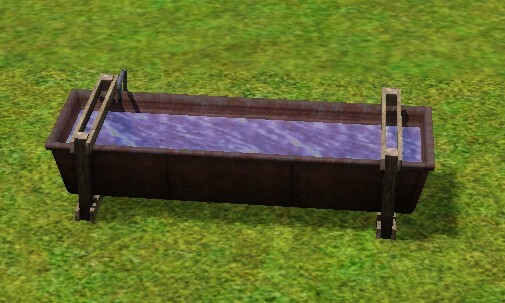 Are fully functional when placed in-world- for the hitching rails, horses can be hitched to them and can eat and drink; for the water trough, horses can drink from it. #2 7th Dec 2010 at 2:43 AM Last edited by simsample : 29th Aug 2011 at 1:11 AM. Reason: Updated Files, corrected typo! Please note: You must have Riverview working and installed in your game for these items to work! Updated files to packaging bug- please redownload all Riverview files and test again! Thanks. The Riverview items are a little more tricky to get into CAW; this is because some of the files are saved in your DCCache folder and some in the actual Riverview World folder. This means that we either have to make CAW read your DCCache and World files, or else we have to extract the items to place them in your CAW framework files. 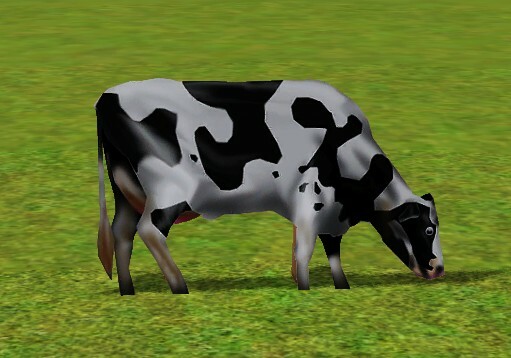 Another problem is that The Sims 3 will only read your DCCache files- it does not read a world file unless that world is being played. So, the files which are in Riverview World file will not be available in any other world unless extracted. This is why these files are complete cloned objects, modified to show in CAW. You still need Riverview installed to make these work, however- and people who play worlds you have created using these will need Riverview installed, too. 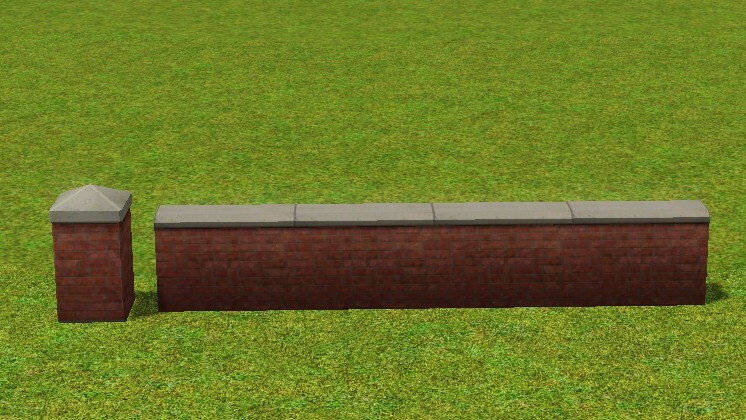 If you use these objects in your worlds then people who play your worlds will NOT have to download these items, but they will need Riverview installed. These are separate package files so that you can choose which you want. 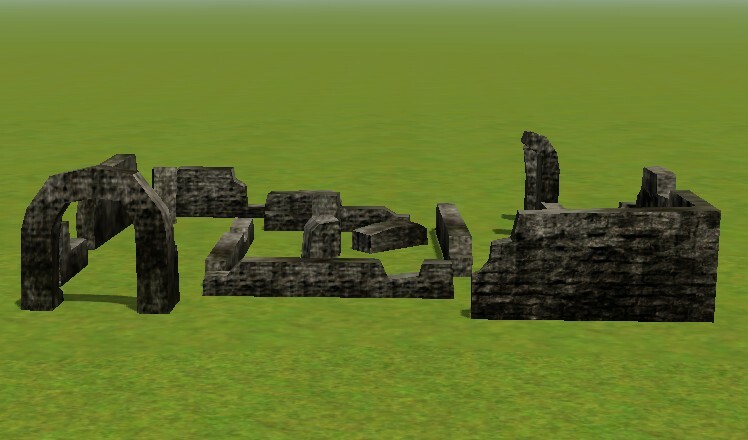 If you want to play a world created with these objects then you will also need to install file Bluefunk_Riverview_Bridges_InGame.package.zip which makes these objects available when you are not playing Riverview. This file must be extracted to your Game Framework Files. You may link people to this thread so that they can download this file, or you may include it in your files, but please remember that this is IN TESTING. People who play worlds created using these objects will ALSO NEED RIVERVIEW INSTALLED TO THEIR GAME. In four different sizes, all bundled into one package. 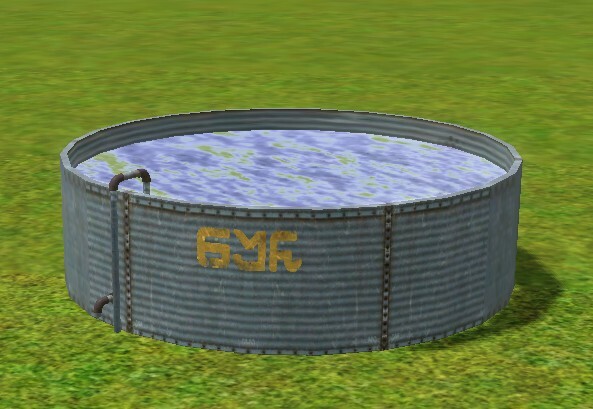 If you want to play a world created with this object then you will also need to install file Bluefunk_Riverview_DistantTerrain_InGame.package.zip which makes this object available when you are not playing Riverview. This file must be extracted to your Game Framework Files. You may link people to this thread so that they can download this file, or you may include it in your files, but please remember that this is IN TESTING. People who play worlds created using these objects will ALSO NEED RIVERVIEW INSTALLED TO THEIR GAME. 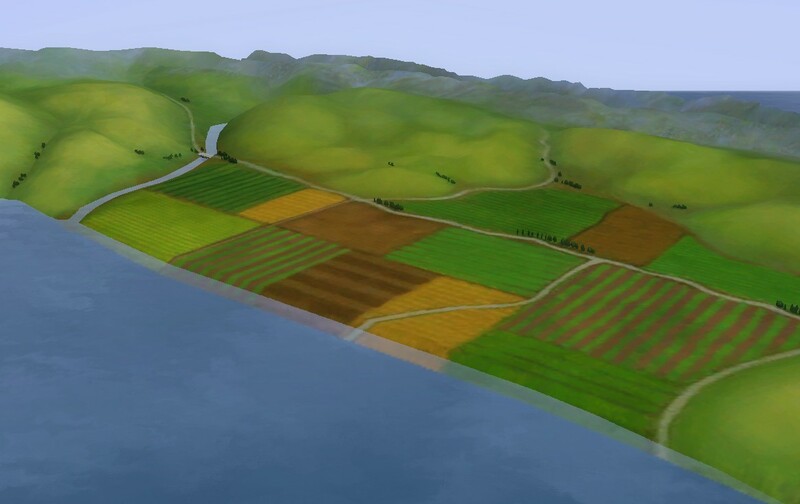 Beautiful distant terrain with farmland, river and hills, which will surround your world on all four sides. It's tricky to place in CAW- try grabbing the red, green or blue direction axis instead of dragging the object. You could alter the rotations for a custom world, to give sunrise/ sunset at different locations on the horizon. #3 7th Dec 2010 at 2:44 AM Last edited by simsample : 19th Apr 2012 at 11:18 AM. These items are not for CAW- they are game objects and should be installed to your Game Framework files. You might like them when building lots for your world. Again, I have not modified these items at all except to enable them for in-game use. Some may have also been released/ extracted by other people- if so, I apologise for the duplication. If you share lots/ worlds made using these items, people do NOT need to download these- they are already in the game files. These mods just make them available in the catalog. These require Late Night EP. These show up in the buydebug Miscellaneous menu. Please note that they cannot be deleted once placed, as per game design. If you are using in a 'Suburb' world then the trucks will be parked and will disappear/ reappear occasionally. To make them drive around it seems that you need a 'City' such as Bridgeport. Discussion on that in this thread, please read the entire thread before you do anything! I've found that in a large world you will need several trucks/ parking spaces to get a good result- I used 15 in Sunset Valley. The truck is CASt enabled. This shows up in the buydebug Miscellaneous menu. Once you place it on a residential lot, the residential mailbox will vanish. This requires Basegame only, shows up in the buydebug Miscellaneous menu. 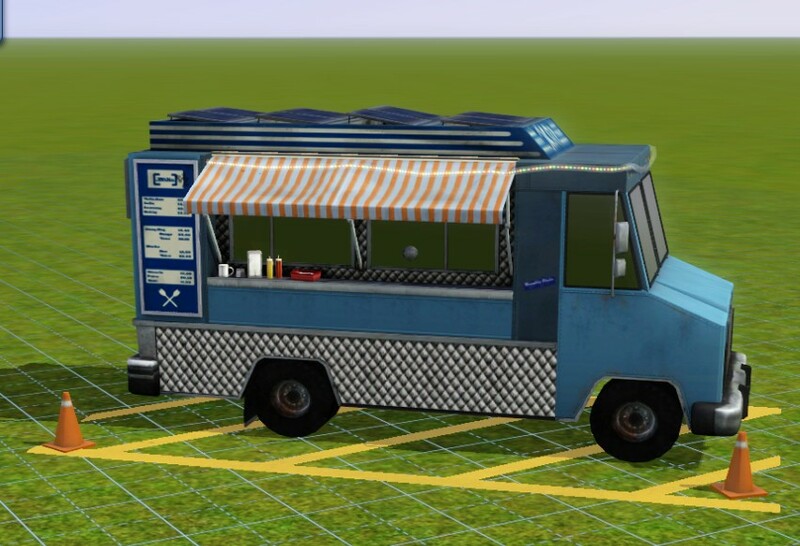 In Sunset Valley Central Park, this is the object that allows townies to autonomously have a picnic. 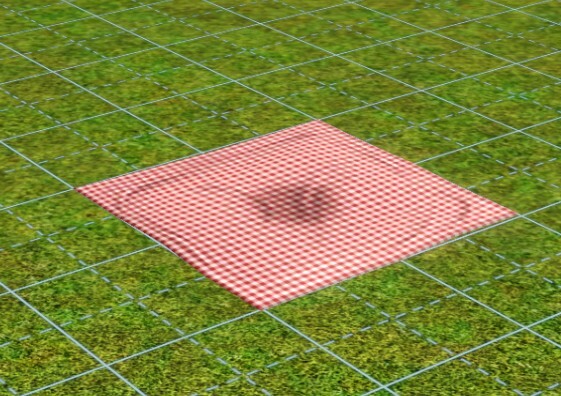 Place the blanket on your lot and then, in live mode, it will vanish until a townie decides to use it. Requires World Adventures, show up in the buydebug Miscellaneous menu. 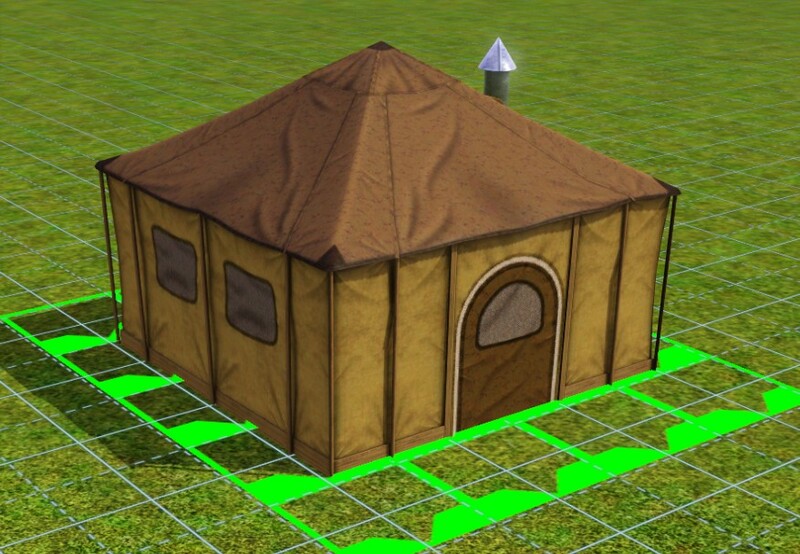 These are the erected tents so that you can build your own base camps in a vacation world, or just make a camp ground in your main world. Sims will not put these in their inventories. These require the Showtime EP. 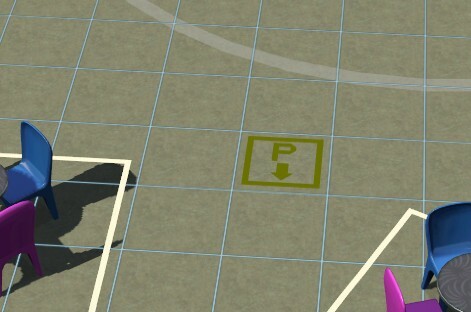 These show up in the Community Objects section in Build Mode, alongside the rabbithole buildings. If you filter your build mode items by 'Showtime EP' you will be able to find them more easily in the catalog.They are called 'Hoi Polloi Event Center' and 'The Binder Clips Center' in catalog. The Hoi Polloi is a Theatre rabbithole, which you can also build a showtime stage within. The Binder Clips is a Stadium shell, which you can also build a showtime stage within. For both of these shells, if you place them on a lot zoned as 'Big Show Venue' they will function both as the designated rabbithole as well as a Big Show Venue, just as they do in Starlight Shores. Please note that these shells cannot be moved or deleted once placed, as per game design. Both shells require a 64X64 lot. 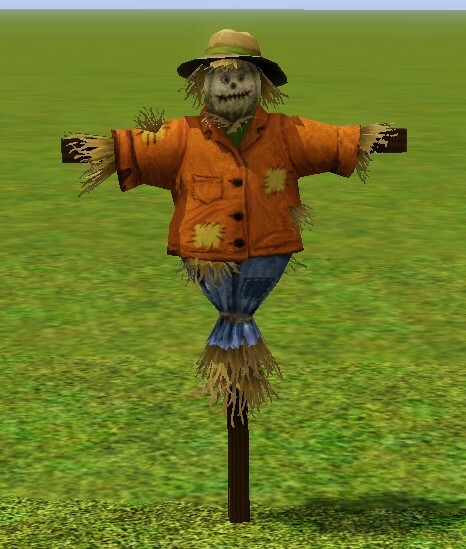 This item is not strictly needed to create custom show venues, since any showtime lot with a stage will eventually spawn one of these. However, if you would like more control over where your proprietor stands, you can use this item. It shows up in Buydebug; filter the catalog for the Showtime EP to find it more easily. As with the crowd placement items, when you first place this object it will be invisible, but if you enter out of buy mode and back in it should appear. Only use one per lot; more than one Proprietor is not necessary. 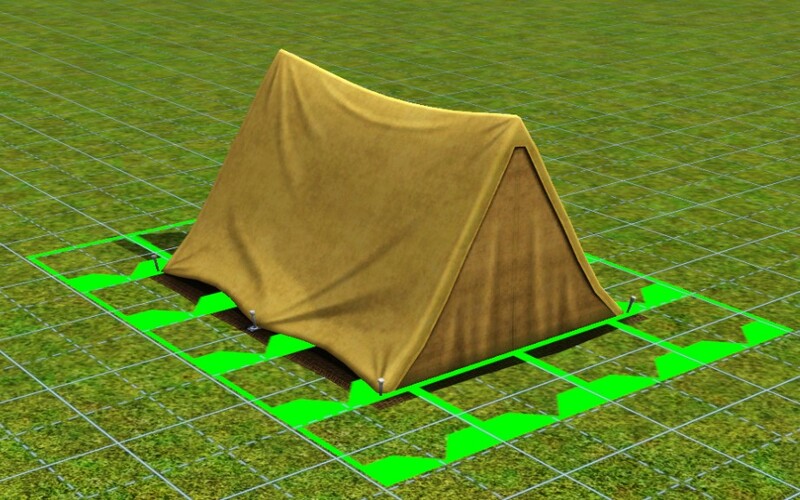 As per game design, this object cannot be deleted once placed; however you can move it using the Moveobjects On cheat. Please let me know if you find any problems with these items; please backup your savegames before installing. #4 7th Dec 2010 at 8:05 PM Last edited by heaven_sent_8_18 : 7th Dec 2010 at 8:23 PM. I am absolutely ecstatic that I found this. I am in the process of editing Riverview (kind of a in-the-future, population growth Riverview) but it's just not the same without the distant terrain. All rotations should = 0. Oh thank you, Heaven! You truly are 'heaven sent' as I was just about to try to place this. You have saved me so much time and frustration. 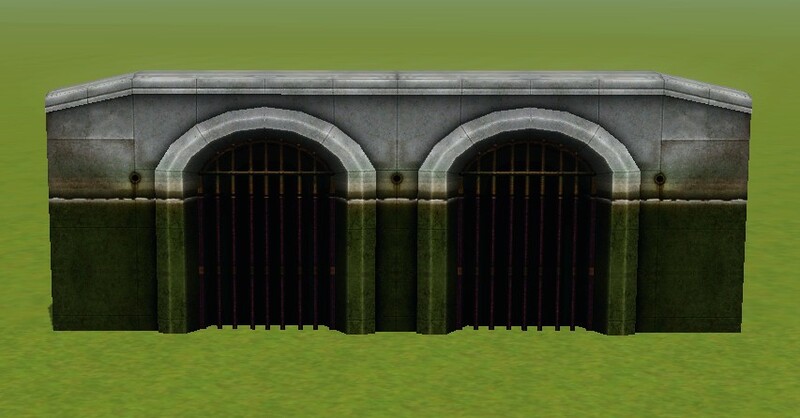 If you want to play a world created with these objects then you will also need to install file Bluefunk_RiverviewDTBridges_InGame.zip which makes these objects available when you are not playing Riverview. This file must be extracted to your Game Framework Files. You may link people to this thread so that they can download this file, or you may include it in your files, but please remember that this is IN TESTING. I went to EIG and the distant terrain and bridges were missing. I am assuming I missed this file, but where is it? It's there now- remember to put that one in with your game mods, not with your CAW mods. I love Indonesia. Unfortunately Indonesia has a bad governmental culture and corruption. Thankyou GiLaNg- it was your instructions that allowed me to do this! Thanks everyone for testing for me and commenting, please let me know of any problems you find! I have used both the distant terrain and the bridges for Riverview and have had no problems (besides not being able to find it that first go-round in EIG ). I will say that if you are in CAW and move your position outside of where you allow the camera to go in game and then click Edit In Game, it puts you in a really strange spot in game and doesn't allow you to zoom in close (you go under the ground and it's just odd). This may be common knowledge but I've never used distant terrain before so I was edging around the map, making sure things were lined up properly and then went in. When I went back to CAW, moved to the center of my map, and then went back to EIG, it was fine. 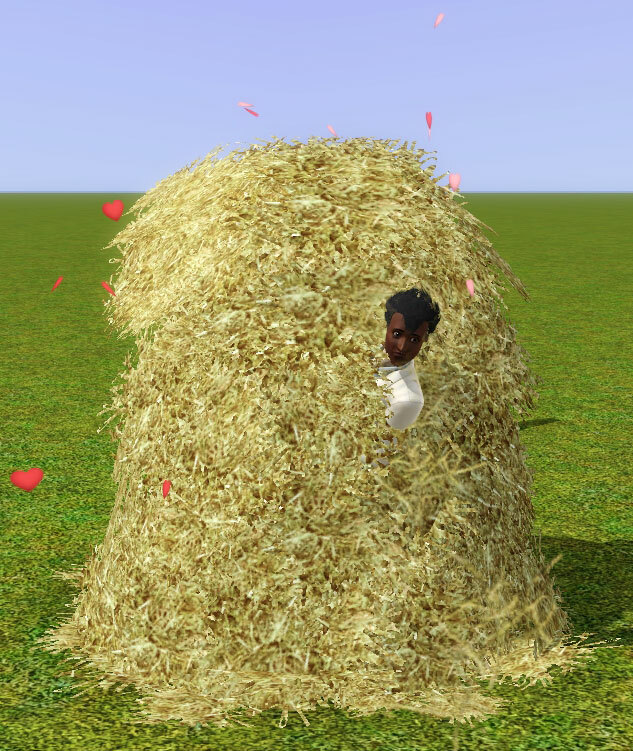 Visit me at http://www.thesims3.com/mypage/MaiLyn ! #13 11th Dec 2010 at 8:59 AM Last edited by simsample : 11th Dec 2010 at 9:27 AM. ejay07, try installing them without using the symbolic link, to see if they show up. 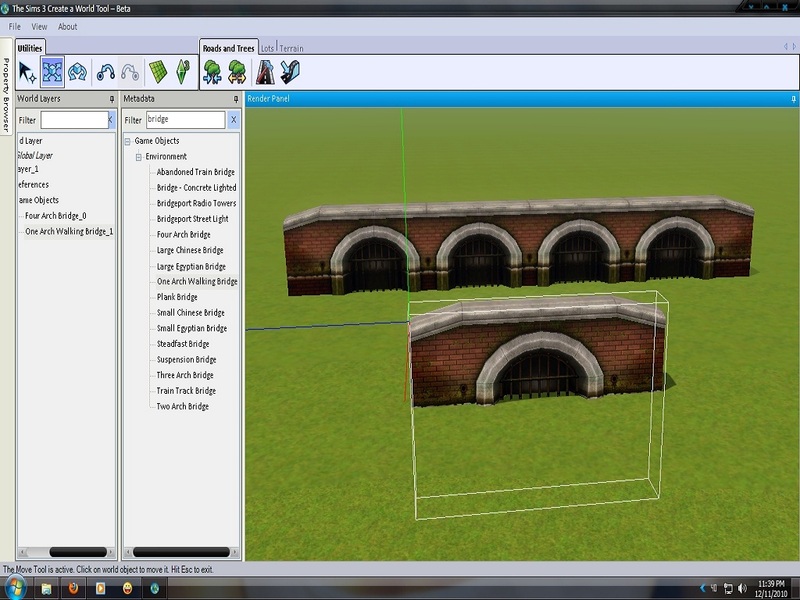 The description name on your bridge is not correct, so this shows that something is not right. ETA- Also make sure you have Riverview correctly installed to your DCCache folder/ Installed Worlds folder. Absolutely brilliant! Thanks for sharing these, simsample. These are brilliant! Thanks so much for adding these - the RV terrain is a much better match for my world! Do you know if anyone has managed to extract the bridge from Barnacle Bay? This is Christmas in advance! A huge 'thank you' Simsample, this is brilliant. ejay07, I'm glad you got it to work! girlfromverona and bellatrixclovis- I'm glad you like them, please do let me know if you find any problems. If you install your copy of Barnacle then you will probably find that some of the objects are in the DCCache files, and some are in the World file itself. #19 12th Dec 2010 at 8:58 PM Last edited by Gail.wyness : 15th Dec 2010 at 8:52 PM. The objects are all showing up fine in CAW and EIG,but CAW is having some slight issues now, not sure if it's due to the Riverview items, it was fine with the Twinbrook item by GiLaNg, but that was before NL patch. Crashed messages appears at random when searching for items in meta data. Not a major issue away as CAW continue running normally for me after hitting "ignore" and the Riverview distance terrain is much prettier then the others. Thanks for uploading them. 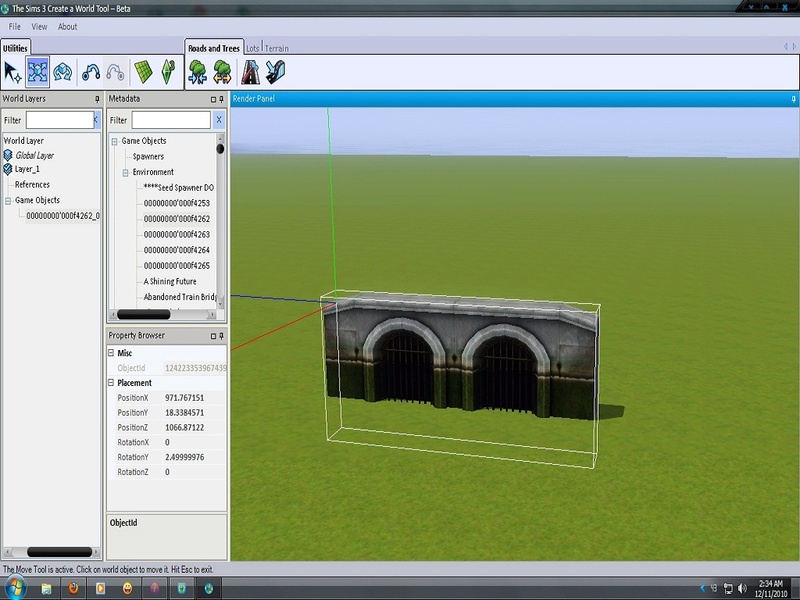 And Documents\ Electronic Arts\ The Sims 3 Create A World Tool\ UserToolData\ LocalWork. This could help, as I'm convinced that this is a memory error. Possibly it is exacerbated by having custom content (as CAW isn't Large Address Aware unless you have made it so) but I doubt it's directly due to these items. Please let me know if it continues for you, though. Well, I found a problem! 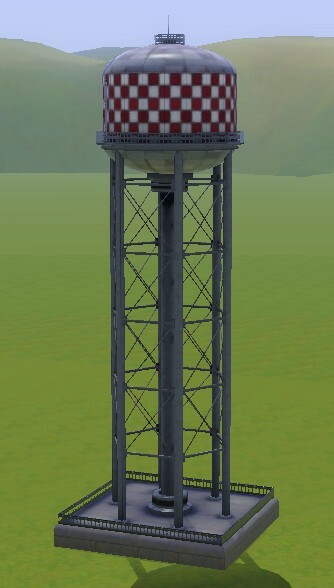 Could anyone else test and see if the Checkered Water Tower (not silo) attached to exported worlds in CAW like a clingy... ...thing? It has attached itself to my Riverblossom Hills and it refuses to detach even once uninstalled and using Save As. I can delete it using Custard, but that's not ideal. It's not a minor issue, either. It prevents everyone from installing the world. Even if they have Riverview installed it tells them they can't install. Can I just check- do the other items not behave like this, or have you not tested those? I'll take a look later Kiwi_tea- I have engagements over the weekend but will check as soon as I can. Thanks for the report! 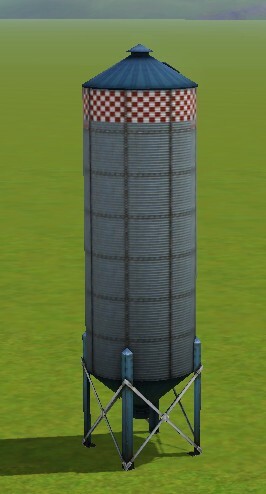 The long trough, checkered silo, and any of the other items I placed did not attached like the tower did. I wrangled it out of the world file, but had to uninstall Riverview entirely to do so. 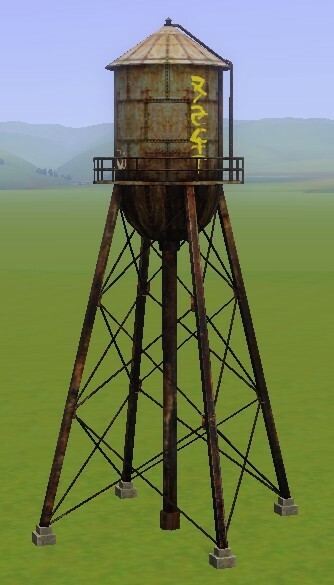 The large checkered water tower must have some feature that adheres to world files. I've had the exact same trouble with the Elder Female Overalls from Riverview, so it's not unique, I think some of the Riverview objects might be buggy when placed in CAW. Also: Season's greetings. Don't worry about this til after the NY. Go have fun. Hubby and I are bunkered down with his sick grandmother this Christmas, so others will have to have all the fun and feasting for us. At least we have hot beach-side Xmases here. Thanks kiwi_tea, I managed to escape the in-laws and check this out this evening. We are going to be snowed in, I think! It's -6 degrees C outside. 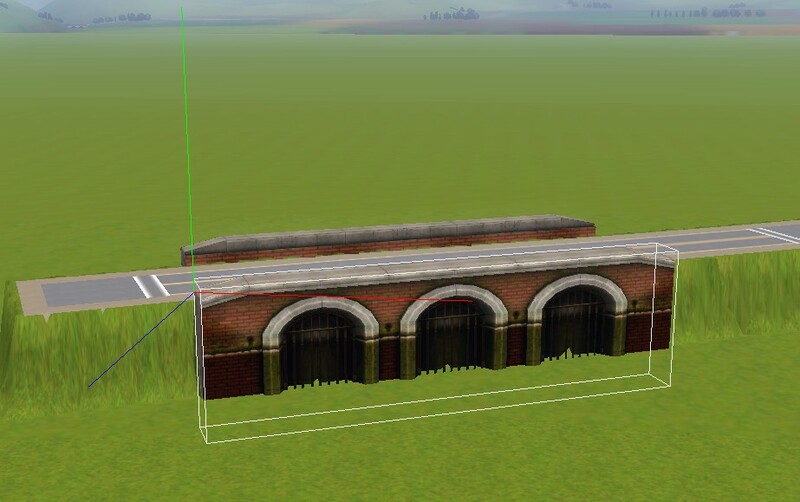 I redid the files, so please could you all redownload the Riverview files and test again for me? Kiwi_tea, the original files worked fine for me with my Riverview install which was done pre-Late Night, but if I redownloaded Riverview and reinstalled it then I got the same problem you did. That's why I didn't spot it! So, I guess something has been changed in the way DCCache files are built, since my files were made from an older DCCache. Anyway, I redid the files from the updated Riverview and updated S3OC and S3pe, and if I package a world with the objects in they show up clean in CUSTARD. So hopefully you will all get the same results! Please let me know if you get any problems, though.